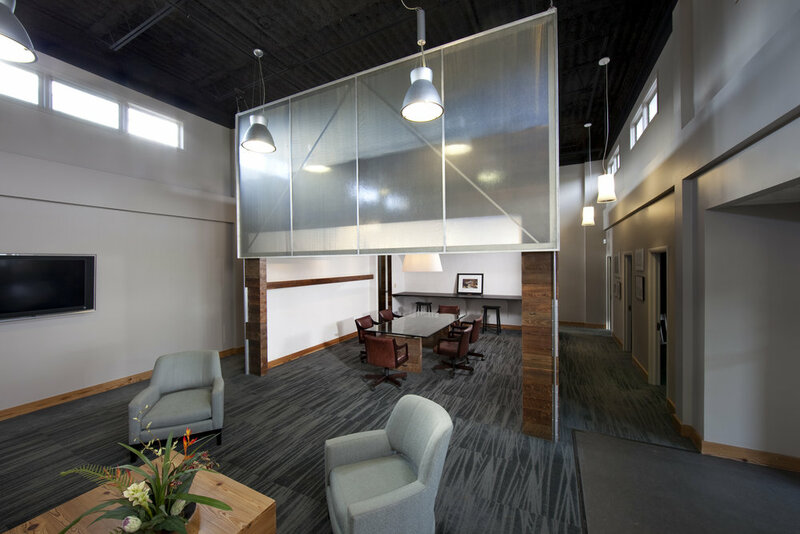 Transitioning away from paper based work, this innovative contracting company asked FORMWORK to transform an area formerly used for plans storage and review into a gathering space for the company and its clients. Our concept was to propose two small "buildings" that stood across from each other to make an interior "plaza" between them. These two structures are tectonically related and are detailed to showcase the level of care these fine craftspeople take with each building task. 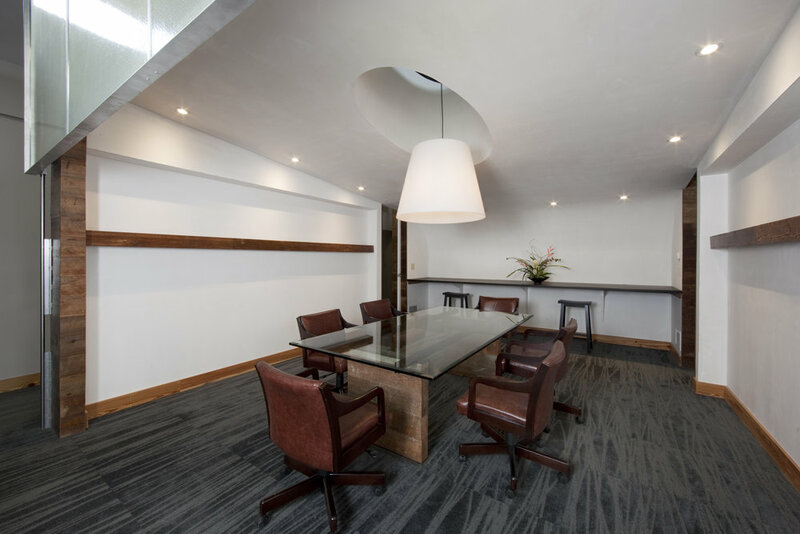 One structure is a conference space that opens onto the open center space so that when private meetings are not in session, each space feels larger than its footprint. This building is finished in reclaimed heart pine on the exterior and white plaster on the interior. The interior plaster space is shaped as a gentle scooped section with a large oculus at its center, a reference to Thomas Jefferson's oculus at the University of Virginia's Rotunda a mile and a half away from this site. The second structure is finished in white plaster and shaped as the solid extrusion of the wooden structure across from it. The subtractions from this volume are lined in the same heart pine on the exterior of the conference structure and hold a long built in sofa, a small supplies area, a receiving counter for packages and the hub where project managers and other staff alert each other to their locations throughout the day. All woodwork was done by the in house carpenters of Martin Horn. The plaster work was done by Cameron Thomas & Sons. Upholstery done by Simin's Custom Sewing.